The Ultrasonic Inspection Robot is able to inspect long distance heat conduits from within. This method allows the wall thickness to be measured 100% accurately. In this way it is possible to detect both interior and exterior damage to the pipe wall. 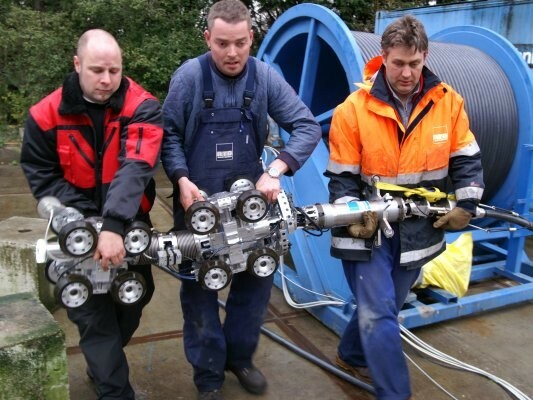 The robot can work within pipes with a diameter of around 300 mm - 500 mm and with a total length of 250 m. The robot is also able to operate within pipes which have compensators and bends. The speed of the robot is roughly 200 m/h, forwards and backwards. 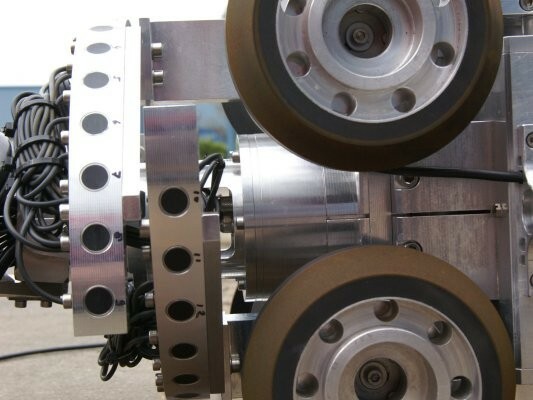 The Ultrasonic Inspection Robot is made up of two drive units, the wheels of which are pneumatically pressed against the interior wall of the pipe. This gives the robot excellent traction. The electronic module for carrying out ultrasonic inspection is mounted at the rear of the robot. A special cable connects the robot with its control unit as well as with the analysis unit. A high resolution camera is mounted on the front drive unit. This provides a real time view of the pipeline. The inspection element retainer, which holds 32 ultrasonic sensors, is mounted on the rear drive unit. The rear drive unit is a two part construction whose wheels can also be pneumatically pressed against the pipe walls. The inspection element retainer is adjustable and can be made to fit the size of the pipe exactly. One of the great features of the Ultrasonic Wall Thickness Inspection Robot lies in its flexible construction. This means that the robot can be used in very cramped conditions. The only requirement is that an opening of roughly 400 mm needs to be present for deployment. This can be done removing compensators from the pipeline. A launcher and receiver unit, as it is usually necessary for intelligent pigs, is not necessary. All data gathered by ultrasonics are transmitted over a special cable and are immediately available online during the inspection. A preliminary analysis can therefore be made during the test. Further more, the robot can be stopped or reversed at any point during the inspection, meaning that a particular point in the pipeline can be checked again. The Ultrasonic Inspection Robot has been developed in a partnership between Applus RTD Nederland and INSPECTOR SYSTEMS GmbH. It is available for your service needs.